I started investigating body movement and became intrigued in the nuances of non-verbal behavior, posture, and gesture. I then became invested in a whole new kind of movement and for many years now it has been the source of inspiration for my work. Since I began my study into non-verbal communication, I am continually intrigued and surprised by how much we communicate with our bodies. The Chemintz Museum of Industry in Germany and the Jewelry Museum of Vicenza, Italy both have shows currently on view which include Crupi’s work. The Vincenza exhibit includes four hundred pieces of jewelry in nine themed rooms. You can see more of the artist’s work on her website. Crupi is based in the New York metro area, where she has been a professor at Kean University since 1999. 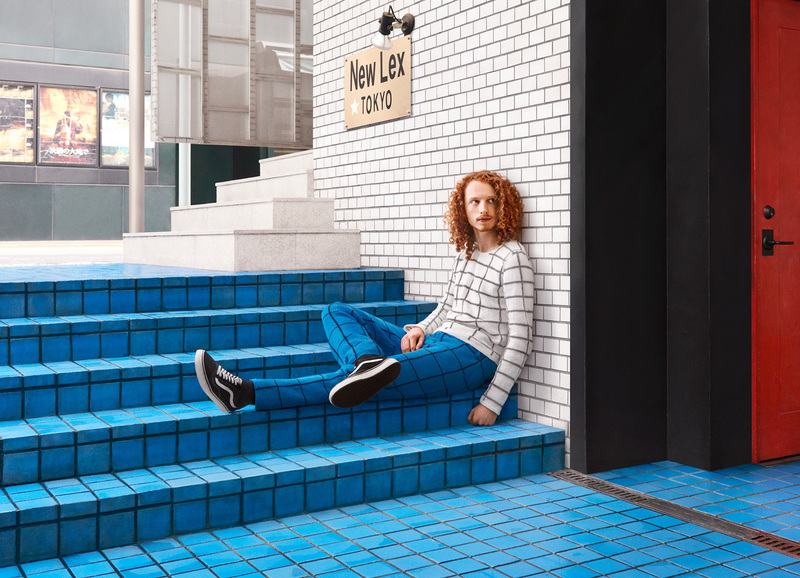 Over the last four years, photographer Joseph Ford (previously) has collaborated with friend and knitter Nina Dodd to create a project that blends models into their environments rather than having them stand out. 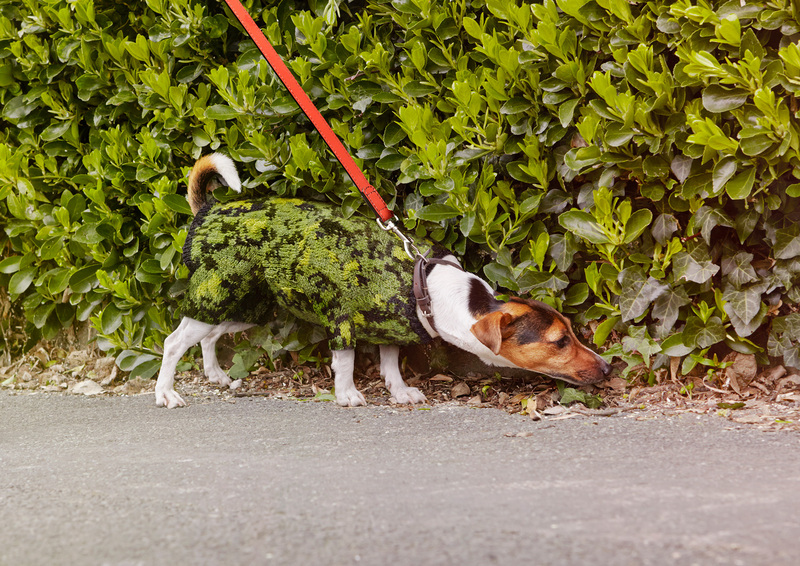 Each subject wears a custom hand-knit sweater by Dodd that transforms their torso, partially camouflaging their body into a highly textured wall, striped running track, or for one pooch—the leaves of dense shrub. 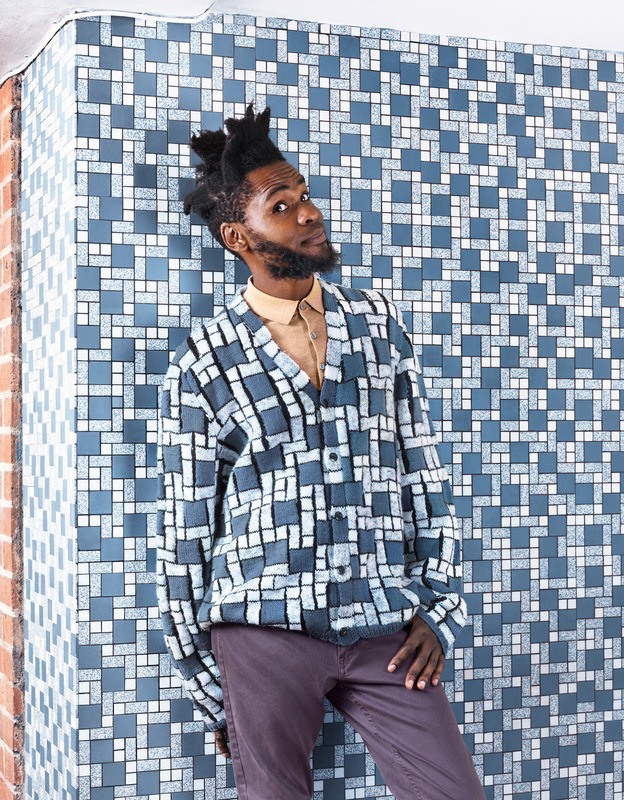 The series, Knitted Camouflage, also features a collaboration with French street artist Monsieur Chat who painted one of his trademark cats on the wall of a derelict factory for the photographer. You can take a peek behind the scenes of Ford’s photographic projects on his Facebook and Instagram. Famed for its radiant skyline at night, Tokyo glows on The LINK Collective’s newest addition to their modern furoshiki line. Featuring a special soft touch glow-in-the-dark paint, the design by Hannah Waldron captures the Japanese megalopolis’s towering architecture in a contemporary, slightly abstracted design. Mount Fuji and a star-spangled sky watch over the city on a background of cerulean blue, accented with red and white. Throughout the day, the glow-in-the-dark paint absorbs ambient light, and at night the city’s windows light up. Furoshiki, the classic Japanese square textile, are meant to be used for a variety of purposes from wrapping packages to picnic blankets and of course, as a scarf. The LINK Collective works with Japanese craftsmen and artists from around the world for their line of hand-made furoshiki. 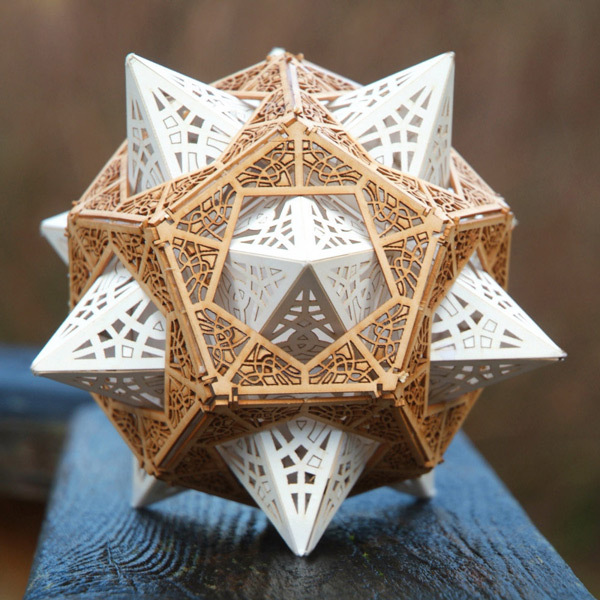 Tokyo and other designs are available in The Colossal Shop. 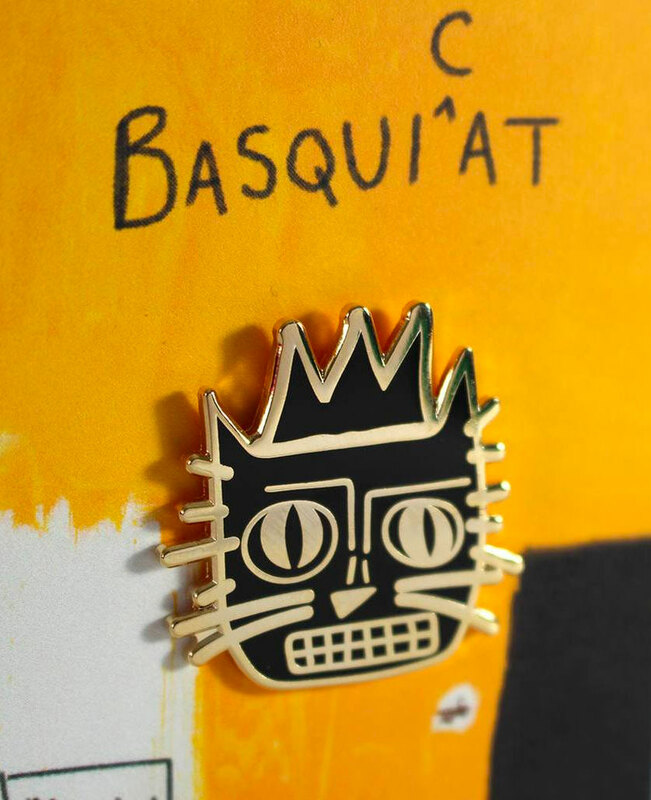 The Pin Museum has a great selection of enamel pins featuring images lifted from iconic paintings and sculptures from Dali to Van Gogh. Their current lineup includes over a dozen different designs, all available in their online shop. Painter Kelly Reemtsen (previously) paints images of anonymous women in thick impasto. The pieces juxtapose high fashion with tools and other construction equipment, placing sequenced high heels alongside sledgehammers and hefty axes. The colorfully painted works are Reemtsen’s comment on modern femininity. By placing tools in each of her subjects’ hands, the LA-based artist showcases that having feminine identification doesn’t mean fitting into a predetermined role. Reemtsen is represented by Detroit-based David Klein Gallery and Lyndsey Ingram in London. You can view more of her fashionably dressed subjects on her website. New work from literary jeweler Jeremy May (previously) transforms the dense layers of books into jewelry that carries the words within each individual, wearable form. Littlefly, his line of rings, necklaces, bracelets, and earrings, reinstalls the finished jewelry in the book that it was originally extracted from, but each piece also has a life of its own with abstract patterns and sculptural shapes.